One of the dirtiest words in the financial playbook is bankruptcy. The damage bankruptcy can do to your financial health, confidence and future endeavors is not to be downplayed. While with a good bankruptcy lawyer you can come out ahead, you will still be stuck with a ruined credit score and low chances of financing. The road to bankruptcy is often quite complex and encompasses a number of decisions and choices, but it all ends the same way. So how can this dirty financial word be avoided? 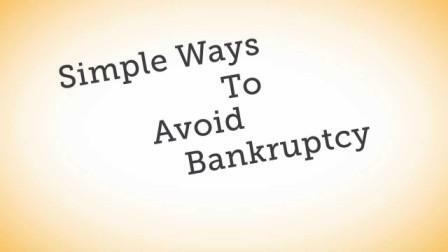 Included here are a few tricks to help you maintain financial health and avoid bankruptcy. The first step to financial health is to live below your means. This seems like a quite simple concept, but many people seem unable to grasp it. Financial experts recommend living on 25% less than what you make. This means, each month, your compiled living expenses and indulgences should reach no more than 75% of what you make. Some people who feel like they are already living on less may find cutting out 25% of their income to be unattainable. It is at this time you need to reevaluate your job and what you consider to be the “necessities.” Decide whether you need to pursue new job opportunities or if you simply need to downsize your house, car or spending habits. What are you going to do with that extra 25% you just cut out of your budget? The simple answer is to save. The next critical step to financial freedom is to have an emergency fund. While many experts recommend starting out with a mere $1,000 in your emergency fund, ideally you should grow this amount to cover 6-8 months of living expenses. You will gain peace of mind and freedom to pursue new opportunities if you know you have a financial safety net. Once you have created a small safety net of savings and learned to live on less, you can begin to pay off your debt. Debt is the primary reason that most people go bankrupt and most of it is incurred on credit cards. Consolidating your debt into one large loan can allow you to have a lower monthly payment and a lower interest fee. Once you have sufficiently saved and cut debt, you may have a little money left over to invest. While financial experts can be hesitant about this step, it is often advisable if you are debt-free and have a significant savings account. Making your money work for you is the ideal and accruing monetary gains passively has become the new American dream. Always go for safe stocks that promise consistent returns instead of the high-risk, high-return game.